Poetic Lumos-iPadPro2-12.9-Gray - The back is slightly raised with the X form DNA making sure that the entire back doesn't get scratched while providing impact protection. Its a simple protective case that is made up of a thin TPU case that forms the perfect blend of style and protection. Compatibility:Compatible with the Apple iPad Pro 12. 9 1st gen 2015 / ipad Pro 12. 9 2nd gen 2017 materialstransparent tpu skin Product Contents1x Inner TPU skin Made of high grade tpu back case. Stylish tech styling with the new Poetic Design DNA. Tactile grip feature with micro grips for stronger grip position. We also appreciate the fact that the case will be used in conjunction with the apple keyboard and pencil and have created the case to be compatible with both. Poetic Lumos Apple iPad Pro 12.9 Case with Ultra-Thin Impact Resistant Flexible Soft Transparent TPU Case for Apple iPad Pro 12.9 1st Gen 2015 / iPad Pro 12.9 2nd Gen 2017 Gray - Understanding that adding extra bulk will make it heavier, we have designed the case to be as thin as possible while accommodating all these features. Its designed keeping in mind the behavior of users when using a tablet and its functions. Raised bezel to prevent the ipad from coming in contact with any surface. Compatible with the apple keyboard case and has an open slot for docking into the Keyboard case. Unique side slot for the apple pencil for easy accessibility. Poetic Lumos-iPadPro-10.5-Gray - The tpu is of clear texture showcasing the beauty of the iPad Pro. Being a large device the tablet needs both hands to retract it from a sleeve or a backpack, the case provides a resting position for your fingers and your hand is wrapped in a power grip to be secure. The buttons are raised and are quality tested to provide a good tactile feel while clicking the buttons. Descriptionthe Clarity case is designed for the person on the go. Compatibility:Compatible with iPad Pro 105 2017 only. Understanding that adding extra bulk will make it heavier, we have designed the case to be as thin as possible while accommodating all these features. We also appreciate the fact that the case will be used in conjunction with the apple keyboard and pencil and have created the case to be compatible with both. Poetic iPad Pro 10.5 Clear Case Lumos Flexible Soft Transparent Ultra-Thin Impact Resistant TPU Case for Apple iPad Pro 10.5 Transparent Gray - Materialstpu skin product Contents1x Inner TPU skin Made of high grade tpu back case. Stylish tech styling with the new Poetic Design DNA. Tactile grip feature with micro grips for stronger grip position. Raised bezel to prevent the ipad from coming in contact with any surface. Compatible with the apple keyboard case and has an open slot for docking into the Keyboard case. Unique side slot for the apple pencil for easy accessibility. JETech FBA_0902-SP-iPad-Pro-GLASS - High-response and high transparency. Made with high quality 033mm thick premium tempered glass with rounded edges exclusively for the new Apple iPad Pro 12. 9" released on 2015 Made of high grade tpu back case. Stylish tech styling with the new Poetic Design DNA. Tactile grip feature with micro grips for stronger grip position. Raised bezel to prevent the ipad from coming in contact with any surface. Compatible with the apple keyboard case and has an open slot for docking into the Keyboard case. Unique side slot for the apple pencil for easy accessibility. Fit for ipad models: a1584/a1652/a1670/a1671. Made with high quality 033mm thick premium tempered glass with rounded edges exclusively for the Apple iPad Pro 12. JETech Screen Protector for iPad Pro 12.9-Inch 2015/2017 Model, 1st/2nd Generation, Tempered Glass Film - 9" 2015 and 2017 Model. Dust-free, fingerprint-free, one-push super easy installation, bubble free. Retail package includes: 1-pack tempered glass screen protector, dust removal stick, guide stick, instructions, cleaning cloth, life-time warranty card. X shape protects any point impact along with the TPU case protecting against shock. Integrated pencil holder for ease of use and provides a grip area to handle the device. SPARIN iPad Pro 12.9 - X shape protects any point impact along with the TPU case protecting against shock. Integrated pencil holder for ease of use and provides a grip area to handle the device. Not for ipad Pro 12. 9-inch 2018 release WITHOUT home button. Smooth surface: the surface of this screen protector is as smooth as nothing, Apple Pencil will expands the power of Multi-Touch perfectly. Scratch resistant: 9h hardness tempered glass is more effectively withstand the external scratch and impact force, reducing damage to the new iPad Pro 12. 9's screen. Sparin iPad Pro 12. 9 tempered glass screen protector Multi-Touch Compatible / 2. 5d round edge / high definition / bubble-free / anti-Scratch Easy installation: Precise cut and design, automatically attach to the iPad Pro screen smoothly, hassle-free and bubble-free. SPARIN New iPad Pro 12.9 2017 / iPad Pro 12.9 Screen Protector, Tempered Glass/Multi-Touch Compatible/Bubble-Free/Anti-Scratch Screen Protector for 12.9-Inch iPad Pro 2015, 2017 Release - Raised bezel to prevent the ipad from coming in contact with any surface. Compatible with the apple keyboard case and has an open slot for docking into the Keyboard case. Unique side slot for the apple pencil for easy accessibility. Fit for ipad models: a1584/a1652/a1670/a1671. Ultra thin and high definition: add no thickness to iPad Pro's astonishingly slim and light design; Feature high-resolution Retina display as the original screen. If there is a need, please contact SPARIN for the installation videos. Green Onions Supply - Apple pencil compatible: the surface of this screen protector is as smooth as nothing, your Apple Pencil will still expands the power of Multi-Touch and opens up new creative possibilities. For testing videos please visit www. Greenonionssupply. Com/paper-texture-film-testing-video. Your hand slides nicely on the iPad's surface, sounds like paper, making the digital sketching experience much more rewarding. Dust-free, one-push super easy installation, fingerprint-free, bubble free. Retail package includes: 1-pack tempered glass screen protector, dust removal stick, instructions, guide stick, cleaning cloth, life-time warranty card.1. For testing video： Please Visit www. Greenonionssupply. Com/paper-texture-film-testing-video Design Principles: We find that consumers who use a stylus pen on the iPad or Microsoft Surface prefer a better writing/drawing experience. iPad Pro 12.9 1st, 2nd Generation, with Home Button Screen Protector, Paper Texture/Anti Glare/Paper-Like Matte/Made in Japan/Apple Pencil Compatible/Scratch Resistant/PET1 Pack - High quality - high transmittanceapprox. Please open and try it on your iPad. Scratch resistant anti-glare screen protector with the matte finish. Protect the screen - An added layer of protection to extend the lifetime of your monitor/screen. Easy installation - you can enjoy a hassle-free installation that is fast, accurate, and bubble-free by using our dust isolation sheet. Mobilemart US-F-T-PL1-IPAD-PRO-12-9-17 - For testing videos please visit www. Greenonionssupply. Com/paper-texture-film-testing-video. The slide of the pen feels just like you're writing on paper!Features 3H surface hardness and wear resistance. An lcd screen protection membrane perfect for protecting the LCD panel and overlay sheet. No air pockets-uses a special silicone adhesive, so any trapped air is able to naturally escape, and prevents air pockets. 2. 4. Turns glass to paper - feels like paper, friction, writes like paper. Scratch resistant anti-glare screen protector with the matte finish. Protect the screen - An added layer of protection to extend the lifetime of your monitor/screen. Easy installation - you can enjoy a hassle-free installation that is fast, accurate, and bubble-free by using our dust isolation sheet. ClearView Paper-Like Screen Protecter for Apple iPad Pro 12.9-inch 2015/2017 Made in Japan - Made in japan. High quality - high transmittanceapprox. X shape protects any point impact along with the TPU case protecting against shock. Integrated pencil holder for ease of use and provides a grip area to handle the device. Apple pencil compatible: the surface of this screen protector is as smooth as nothing, your Apple Pencil will still expands the power of Multi-Touch and opens up new creative possibilities. SPARIN IM-2 Pack iPad Pro 12.9 Screen-self-01 - You can even rest your hand on the display without leaving finger marks. Universal package - this universal package is applicable for paper texture film. Not for ipad Pro 12. 9-inch 2018 release WITHOUT home button. For testing videos please visit www. Greenonionssupply. Com/paper-texture-film-testing-video. 4. Turns glass to paper - feels like paper, friction, writes like paper. Screen protecter for Apple iPad Pro 12. 9 2015 / 2017. Sparin high definition tempered Glass Screen Protector for iPad Pro 12. 9 compatible with: 12. 9-inch ipad pro 2017 Release iPad Pro 12. 9 inch 2015 release repeatable installation: if there is spot, peel it off and clean the spot, bubble, or section that doesn't adhere, then reposition it and it will stick to the screen again automatically. 2 PACK iPad Pro 12.9 Screen Protector, SPARIN Multi-Touch Compatible / Bubble-Free / Anti-Scratch Tempered Glass Screen Protector For 12.9-Inch iPad Pro 2015, 2017 Release - Made with high quality 033mm thick premium tempered glass with rounded edges exclusively for the Apple iPad Pro 12. 9" 2015 and 2017 Model. Perfect fit: exclusively design for the 2015 & 2017 release ipad pro 12. 9 inch, not fit the 2018 Released iPad Pro 12. Apple Computer MK0C2AM/A - Perfect fit: exclusively design for the 2015 & 2017 release ipad pro 12. 9 inch, not fit the 2018 Released iPad Pro 12. 9 inch withoUT home button. Easy installation: ipad pro 12. 9 screen protector designed with the air-exhausting adhesive can automatically attaches to the iPad Pro 's screen smoothly, hassle and bubble-free. Apple pencil compatible: ultra thin ipad pro 12. 9 screen protector provides an accurate touching experience, no interference to the Multi-Touch subsystem when using touch and an Apple Pencil. Ultra clear: this tempered glass features high- resolution Retina display as the original screen of iPad Pro 12. 9 does. Apple Pencil - High response: only 03mm thickness makes you feel almost nothing on the screen, to preserve original viewing quality, NO interfere with the touch sensitivity. The apple pencil expands the power of iPad Pro and iPad 6th generation in productive new ways. Easily write, mark up, and draw with pixel-perfect precision. Nothing else feels more responsive and natural. For testing videos please visit www. Greenonionssupply. Com/paper-texture-film-testing-video. 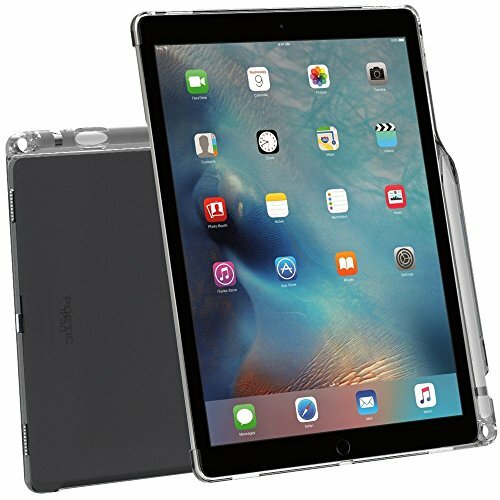 ProCase - Case compatibility: only compatible with 2017 Apple iPad Pro 12. 9 inch and 2015 iPad Pro 12. 9" not compatible with any other tablets. 4. 90% with little hazeApprox. Turns glass to paper - feels like paper, friction, writes like paper. X shape protects any point impact along with the TPU case protecting against shock. Integrated pencil holder for ease of use and provides a grip area to handle the device. Please check back bottom of your iPad to find the model number. Scratch resistant: 9h hardness tempered glass is more effectively withstand the external scratch and impact force, reducing damage to the new iPad Pro 12. ProCase iPad Pro 12.9 2017/2015 Companion Back Cover Case, with Apple Pencil Holder for iPad Pro 12.9 Inch Both 2017 and 2015 Models, Match for Apple Smart Keyboard and Smart Cover –Grey - 9's screen. 3. Not for ipad Pro 12. 9-inch 2018 release WITHOUT home button. For installation videos, please visit www. Greenonionssupply. Com. The slide of the pen feels just like you're writing on paper! Premium composition leather exterior and smooth interior lining offer great protection against daily use; Flexible TPE edge absorbs accidental bump and easily puts your iPad into the case. High definition: features high- resolution Retina display as the original screen of iPad Pro does. Supershieldz 4328650198 - Scratch resistant: 9h hardness tempered glass is more effectively withstand the external scratch and impact force, reducing damage to the new iPad Pro 12. 9's screen. For installation videos, please visit www. Greenonionssupply. Com. The slide of the pen feels just like you're writing on paper!5. Scratch resistant anti-glare screen protector with the matte finish. Protect the screen - An added layer of protection to extend the lifetime of your monitor/screen. Easy installation - you can enjoy a hassle-free installation that is fast, accurate, and bubble-free by using our dust isolation sheet. Premium composition leather exterior and smooth interior lining offer great protection against daily use; Flexible TPE edge absorbs accidental bump and easily puts your iPad into the case. Ztotop ZT iPad Pro 12.9(2017/2015)Black - Fits ipad models: a1584 a1652 a1670 A1671 A1821. 90% with little hazeApprox. Features 3h surface hardness and wear resistance. An lcd screen protection membrane perfect for protecting the LCD. Made in japan. For installation videos, please visit www. Greenonionssupply. Com. The slide of the pen feels just like you're writing on paper! Compatible with 1st and 2nd generation - 2015 and 2017 releases, model Number: A1584 A1652 A1670 A1671 A1821 Magnetic smart cover supports auto wake & sleep function. Built-in apple pencil holder & adapter effortlessly whenever you want, easily to carry your Apple pencil with your device. Precise cutouts allow full access to all features Cameras, Speaker, Ports and Buttons. Ztotop Case for iPad Pro 12.9 with Pencil Holder, Secure Magnetic Stand Folio Case with Auto Wake/Sleep,Adjustable Angle Viewing,Soft Silicone Back Cover for Apple iPad 12.9-Inch 2017/2015, Black - Premium composition leather exterior and smooth interior lining offer great protection against daily use; Flexible TPE edge absorbs accidental bump and easily puts your iPad into the case. Perfect fit: exclusively design for the 2015 & 2017 release ipad pro 12. 9 inch, not fit the 2018 Released iPad Pro 12. 9 inch withoUT home button. Easy installation: ipad pro 12. 9 screen protector designed with the air-exhausting adhesive can automatically attaches to the iPad Pro 's screen smoothly, hassle and bubble-free.